On-line course developed on cooperation with the Spanish Maritime Institute (IME). Main target of this course is provide to students with a specialization in management of a fishing company, offering a complete overview of this business. 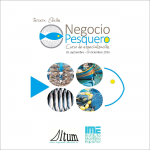 For more information, please contact with IME (http://www.ime.es/site/es/cursos-on-line/negocio-pesquero.html) or directly with us.